Have you hestitated to get into the Rainbow Loom craze because the patterns seem too difficult? Do you feel like you don't know where to start? Have all your friends been looming for months already? AllFreeKidsCrafts is here to help! With this list of 10 Beginner Bracelets + Video Tutorials, you'll be hooked on making Rainbow Loom bracelets before you know it. Whether you're 9 years old or 90, you can learn how to make Rainbow Loom bracelets! All you need is a loom, some rubber bands, and the right tutorials. One of the best things about Rainbow Loom bracelets is that you don't need to make crazy, complex design to look cool. The simplest patterns look just as awesome! Beginner Rainbow Loom designs like these look good on their own, or stacked high on your arm. 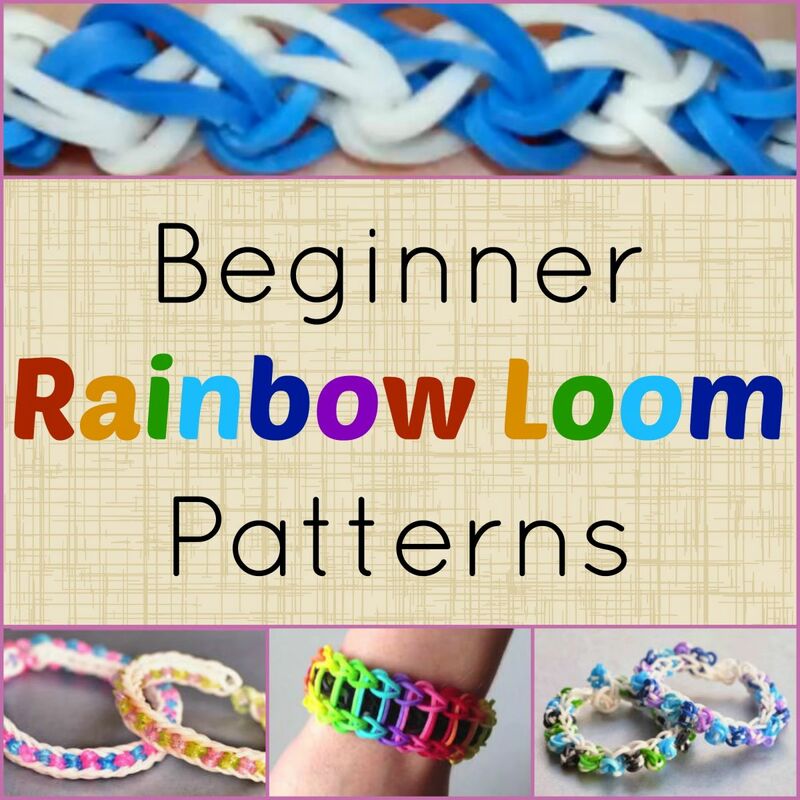 These beginner Rainbow Loom patterns will give you the confidence to show off your skills to everyone you know, and before long you'll be ready to tackle all sorts of unique Rainbow Loom designs. Ready to start your brand new hobby? Then it's time to take on these video tutorials! Start with this Single Rainbow Loom bracelet. If you've already tried the No-Loom Beginner Bracelet, this Rainbow Loom pattern should be a breeze! Plus, this video will give you some useful tips and tricks to keep in mind as you're making your new DIY jewelry. This is probably the quickest of our beginner Rainbow Loom patterns! This is the perfect place to start if you're still learning how to make Rainbow Loom bracelets. Become a Rainbow Loom magician with this bracelet pattern. This Rainbow Loom design uses a more unconventional technique, but it's easier than you might think. Your friends won't believe you when you say that this Rainbow Loom bracelet was actually very easy to make! Ready to get a little edgy? This Rainbow Loom pattern idea is fairly simple, but the final result will make you look like a Rainbow Loom bracelet master! You'll need to make sure you've practiced the first two video tutorials on this list before trying this one, but if you have those patterns down, you're good to go. This Rainbow Loom bracelet is tons of fun! Similar to the classic fishtail design, this bracelet has an interwoven look. Stack several of them together for a cool, trendy look. Now that you're in the looming groove, add a little pizzaz to your Rainbow Loom designs! This bracelet pattern works up relatively quickly, so you can show off your new DIY jewelry skills to all your friends in no time. Also, this Brilliant Rainbow Loom Charms project is perfect for anyone who needs to add a splash of color to their day. This particular Rainbow Loom bracelet is probably the most complex of our beginner Rainbow Loom patterns, but don't worry. Now that you've made it to the bottom of our list, you're practically a pro! Once you've mastered these Rainbow Loom patterns, give yourself a challenge and move on to our list of 6 Incredible Rainbow Loom patterns! This beautiful Rainbow Loom bracelet pattern is made by a fellow kid crafter and its video has helpful instructions. If you're looking for a homemade gift idea to make your friends or even a DIY gift idea for Mother's Day, then get out your loom! If you make a few DIY bracelets in different colors and with different pendants, your friends are going to love their gift! The Rainbow Loom Fishtail Bracelet is one of our most popular Rainbow Loom bracelet patterns on AllFreeKidsCrafts. There are many Rainbow Loom patterns, but this one is easy to personalize for yourself or as a gift for others. What colors will you use to make the DIY bracelet? Peace out, man! Make your peace-lovin' friend a Peace Sign Rainbow Loom Bracelet that they will want to wear all day, every day. Personalize each DIY bracelet with a different colored pendant or even different colored bands. Your friends are going to absolutely love this homemade gift idea! What is your favorite color of the rainbow? Tell us below! My kids still love Rainbow Loom projects. Always looking for something new to share with them. These are good ideas. Do you have Pdf version of instructions? Does this info come in an ebook?